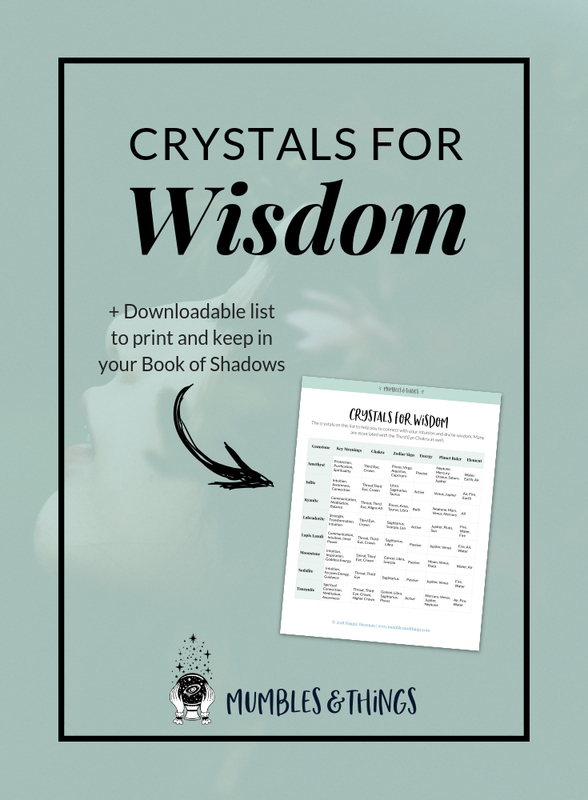 Within this blog post you will find a list of eight crystals you can use for connecting with your intuition so you can understand the wisdom of the Universe. Each of these is also associated with the Third Eye Chakra. You've probably heard of chakras before, even if you aren't clear on what they are. Based on the Sanskrit word for "wheels," the seven chakras are spinning energy centers found throughout the body. Each one is associated with a different color and effect on your body. The sixth chakra—also known as the third eye chakra—is the center of perception and command. It directs your sight and everyday awareness of the world. Your consciousness is located here. The third eye chakra interprets the world: your inner world, and the world that comes into the body, primarily through sight. When this chakra is in balance, you see clearly and understand what you see. You are able to interpret visual cues and your perception is high. You are open to new ideas, dreams, and visions. Color is a good place to start when looking for crystals to help you balance and open the chakras. The color often associated with this chakra indigo or dark blue. Kyanite is a stone for all forms of communication, including communication with the divine wisdom. It is incredibly useful during meditation to bring balance and creativity into your life. Kyanite strengthens commitment, honesty and loyalty not only in relationships with others but in your relationship with yourself. Iolite strengthens the resolve to take on responsibility and follow through, and provides self-assurance and endurance in adverse situations. This stone inspires you to bring order into a chaotic life, and helps provide solutions to problems. Iolite connects you to your muses, activating the creative side of the mind, and accessing thoughts and ideas beyond the ordinary. Sodalite is a stone of the deep journey. It can be effective for reaching hypnotic or trance states. It can detach one from the worries and concerns of everyday life and helps one see reality from a higher, more serene perspective. This stone clears the mind, calms inner conflict, reveals truth, and offers wisdom. Amethyst increase your spiritual awareness and transmutes unhelpful energy into energy that is beneficial to you. It is a high vibe crystal that also calms and soothes, bringing about peace, love and happiness. Use amethyst to provide protection to your psychic energy and spiritual communication. Tanzanite brings together all aspects of communication and psychic power. Its high vibrational energy invites protection and safety in linking with higher realms, and allows for deep profound meditation. It is particularly helpful in uniting the mind and heart, teaching one to live from a compassionate heart with an illumined mind. Use Labradorite for psychic protection and to develop your intuition, especially when it comes to divination. This stone facilitates transformation of stressful energy and brings about a sense of calm. It is a stone of strengthening conviction and courageous action. Labradorite offers patience, imagination and introspection. Moonstone is a wonderful stone for connecting with your intuition. It's inspiring energy can offer clarity and spiritual understanding and is strongly associated with the goddess energy. Moonstone is thought to relieve stress, calm emotions, open heart to love, and increase feelings of hope and joy. Lapis Lazuli is a very intuitive stone with energies of wisdom, strength, tranquility and compassion. It is thought to heal emotional wounds and develop your inner power. Use it for communicating with the divine, especially through divination techniques such as reading the Tarot or casting Runes or when recalling past life experiences. Lapis Lazuli is a stone of clarity and increased spiritual love. Continue your journey and share your experiences on the Mumbles & Things Facebook Page. What stones do you use to help you connect to your intuition and work with your third eye chakra? Tell me about it in the comments below.